For the first time in the history of the Apple iPhone, Apple reported lower sales of the device on a year-over-year basis. For the company's fiscal second quarter, which covered the period from January through March, Apple sold 51.2 million iPhones. That was down 10 million units from the 61.2 million it sold during the same quarter last year. That works out to a drop of 16.3%. Despite the decline, Apple still managed to top Wall Street expectations which called for Apple to report a sales decline of 20% to 50.7 million handsets sold. But the average selling price, at $641, fell below expectations of $658, another dagger in the heart of Apple investors. For the quarter, iPhone revenue amounted to $32.86 billion. At the same time, the company announced that it had sold 10.25 million iPad tablets, which amounted to revenues of $4.41 billion. The year-over-year decline in iPad sales amounted to 19%. Even more scary for Apple, overall sales to the Greater China region fell 26% over the year to $12.49 billion. Tim Cook called the three months a "challenging quarter" and added that it is still the early innings of the iPhone. Apple added that many had upgraded to the new Apple iPhone 6s and Apple iPhone 6s Plus earlier than usual, creating a shortfall in demand for the period. The new 4-inch Apple iPhone SE and 9.7-inch Apple iPad Pro were not included in the figures since they went on sale too late to be included in the quarter. Apple did not disclose sales of the Apple Watch. 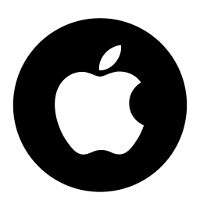 Overall, Apple generated revenue of $50.55 billion for the quarter, off 13% from $58 billion a year ago. The company earned $10.52 billion, or $1.90 a share. Last year's net was $13.57 billion, or $2.33 a share. Investors were dumping Apple shares after the report with the stock trading at $97.25, down $7.10 in after hours trading. It is not doomed, but let's see what happened to the former giants Nokia and BlackBerry. They used to sell hundreds millions of phones and generate billions of dollars just like Apple. Nokia had a terrible and arrogant management that refused to innovate (IN SOFTWARE) or join the big Android. On the other hand, BlackBerry's former CEO Mike Lazaridis mocked Apps Store in iPhone and claimed that users only need a good web browser to be productive. He also said that users couldn't get rid of physical keyboard. Apple is now following that same path. It Refuses to innovate or give customers what they want. Apple simply applied for hundreds of innovative patents but refused to implement any of them in its new products. A good example for this case is what the iPhone would be!. All rumors claimed it would be so similar to the iPhone 6/6s. Why? Do Apple think that customers would buy another same technology/ design over and over again, just because it only has Apple logo?.. It is somehow true for many Apple fans, but this won't last forever. Millions of Nokia and BlackBerry fans left their lovely products because they are not innovative like before! Apple must read this lesson before it is too late..
And BlackBerry realized its mistake and came up with a great and advanced operating system, but after damage happened and when it is too, too late. Watch out Apple! BlackBerry still has its software and services to fall back to remain in business, as they have transitioned from a hardware-first company to a Software as a Service one. They will still be around, relevant and profitable should they decide to exit handsets. If Apple ever loses handsets, they will close up shop. They are too reliant on the iPhone. BlackBerry is a lot smaller than it used to be. Being a software-only company in the enterprise and regulated industry field, as well as in the IoT will be more than enough for BlackBerry to stay afloat and make a profit. They already hit their software goal for the fiscal year, and with their recent purchases of companies like Good Technology WatchDox, Secusmart, Movirtu, and Athoc, they also have residual income from these companies. And their most recent purchase of Encription, a Cybersecurity company out in the U.K., BlackBerry is now in the Cybersecurity Service business. Their QNX brand gives them the highest market share in the infotainment industry. It's technology is in over 60 million automobiles today, and growing, as well as being the underlying OS that allows Apples CarPlay and Googles Android Auto to function in cars. BlackBerry is well set up to survive without handsets. Apple, on the other hand, relies on the continued sales of the iPhone far too much. They need to diversify quickly, as well as bring new and innovative feature to iOS and the iPhones hardware. He was being sarcastic, John. Customers don't know what they want, they have to be taught. You can't explain sense to a person who doesn't have the capacity to understand. You also left out Microsoft. Windows Mobile was good for its day. Microsoft left the business model that worked, and tried to bring Windows Phone for a more consumer oriented crowd. It probably was a good idea on paper, but it was poorly executed. Windows Phone 7 was basically Windows Mobile 6.5, with a updated home screen. But underneath it was just Windows Mobile with its terrible, illogical UI. It was MS being almost 3 years behind and simply rushed to give us something, where they ripped out all the beneficial Enterprise capabilities to make it consumer oriented which was a bad move. They should have stuck with evolving Windows Mobile to be more like today's offerings, but with Windows Enterprise capabilities underneath in a special mode and still offered a consumer option in Windows Phone variant. But what the fans and Apple need to understand, is that once you start declining, if you don't step in and deal with it right away, there is no point of recovery. So for me what this means for Apple. Everything they are planning for the iPhone 8, actually needs to be done right now for the iPhone 7. Here's why. If Apple makes iPhone 7 be what they plan for iPhone 8, and the sales continue to decline, then it will tell apple right away that the iPhone 8 plans won't matter 2 years from now. The problem has already presented itself and thus, we need to talk to our customers right after iPhone 7 and see what will make them happy. The fact is, for the iPhone to remain a major player, apple has already milked their base. They need to bump up the CPU to at least a QUAD, they need to bring 1440p, they need wireless charging, they need USB Mass Storage and many of the other features Android has now. apple needs to make the iPhone what other phones are. If they don't, the iPhone brand is goign to continue to decline and Apple will never recover. Apple Watch isn't going to save them and the iPad is already declining as people don't see a need to upgrade if you have the Air 2. This is Apple first warning. This has nothing to do with market saturation. Because Apple has nearly 1Billion iOS users. That si enough usage to create a revolving sales of 300M every product release cycle. Look at Microsoft. Even though Vista was a "marketing" disaster, they still managed to sell well over 300M licenses in 12 months. Apple should by now have a revolving sales of 300M easy and they don't. Because they are to busy trying to milk every dime in a single year vs gaining profits with volume sales. Because Value sales gets you money over time, creates more overhead which means less yearly profits and you cant brag about those. And because of this, Apple is shooting themselves in the chest. Everything that goes up must come down. For a few years already we felt an obvious slowdown in technological innovation in Appleet he pressed maximum dividends to distract shareholders. The year 2016 marks the apple history as the beginning of the end of the giant. The entire industry is taking a hit. But daddy will take the blame. The entire industry isn't, with Apple being the only of the top 5 expected to report lower sales. Well Samsung just release its brand new flagship. Of course the demand is going to be very high. Thats pretty weak honestly for a premium flagship as popular as they are. Really? 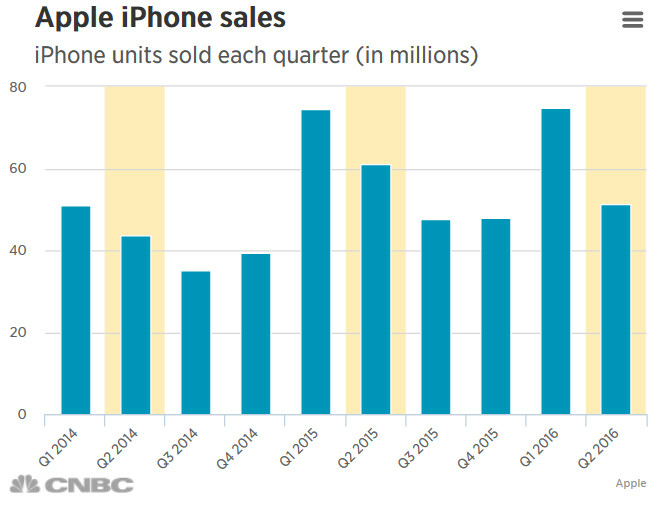 Because in Apple's Q1 they again sold 75M phones for the full quarter even with the holidays. How many models were selling last quarter? iPhone 5S iPhone 6 iPhone 6+ iPhone 6S iPhone 6S+ iPhone SE (1 month) So if you average out 75M sales, on all selling models; is roughly 12.5M sales per model. So we know for a fact the iPhone SE being on sale for 30 days or less wouldn't come close to 12M. Wasn't the number like 3.5M? Also it was said, sales of the 5S increase, likely due to the new drop in cost thanks to the SE. But lets stick with my average sales number. So it took a full quarter for Apple to sell 12M of each model vs Samsung sold 10M in just 20 days which is less than 1/3 of a full quarter? But you're saying that lames? Basically dude, it means the Galaxy S7 alone in 20 days, outsold he 5S, the iPhone 6, The iPhone 6+, likely out sold the 6S and the 6S+, and we know for a fact it outsold the SE; if you compare the sales as a separate single model vs lumping all of them together. Since Apple NEVER releases how many devices sell in a quarter for each model, we can draw some conclusions. We know that in the quarter after a new iPhone sales, there is no way Apple sold 75M iPhone 6S' period. That means its the older models for Apple fiscal 1st quarter that handle most of the sales due to new pricing after the release of the new model. Because n 3 months of production, at most Apple will likely only have 5M of the new phone to actually sells. Which si why most pre-orders dont get delivered for another month or 2. We ordered just 10 iPhone 6S models for our office. We got 5 of them in 2 weeks and the last 5 we didn't get for a total of 8 weeks. Now I dont know how many phones can be made in a month. My guess if roughly 3-5M units MAYBE. So that means by Q2, Apple could potentially sell 30M units of the most recent model if they are lucky. Which means if the Galaxy S sells 10M phones per month, then both companies are selling roughly the same amount of phones on the top end. Which means in MY theory, Apple doesn't sell any more of its latest top model than Samsung does. DO THE MATH. Apple sells maybe what 10-15 phones on pre-order. It takes them 60 days to fill that order if you're lucky. I am assuming production based on, assuming the phone actually goes into production 3 months before its actually release. After Apple has 10M+ pre-order sales, those phones tend to ship right away and the newer are on hold for another 30+ days. Every year we've ordered at least 10 phones from Apple on pre-order and NEVER have we gotten them all right away. We usually get 1/2 in 2 - 3 weeks and the rest by the 8th week. I also recall when I pre-ordered my iPhone 4 with VZW, that when I got my email that it shipped, it was 4 weeks after the order was made and it took me 4 weeks to receive it. Which si roughly how long it takes for a boat to come from china. And my phone shipped directly from Shenzhen. Apple and Samsung do ship many early pre-orders by plane. But because of the cost, they don/t do very many. This is a known fact. Thsi may explain why the 6S' we ordered we got 1/2 the order quickly, while the rest took an additional month+. For a release to this many countries at one time, that means only a few 100,000 will arrive to some markets at a time. In one month after release I woudl guess Apple as well will get up to 10M units into actual peoples hands. That is the same amount of sales as Samsung. Oh no! The big Apple is dead! Robots party on the streets world wide!! On a serious note, Apple better be worried about releasing a 6SE and not a 7 this year. I'm afraid this you decline will be the norm this year. Nah, they'll have a 7 out in time for the Q4 shopping season... and then the news reports will be all aglow over how much money Apple made, and their record sales figures. News cycles have become just like product cycles... predictable. The iPhone isn't going to sell 70M this holiday. Well deserved Apple. This will be just the beginning if Apple is not going to stop milking its customers like in the last years. I love the OS but the hardware is lacking seriously behind the competition (apart from CPU and bandwidth). Is lacking what features? What can't you do with an iPhone (except chopping trees)? Everyone relax if you sell higher and thing lower still beats everyone else. This is coming from the Microsoft fan. Also surface phone probably going to put all the other phones on life support. Also Tim cook buying time because he doesn't have the creative mind of Steve jobs. Panos is Steve job reincarnated. We're reaching saturation point with smartphones, with very little growth left. Also, the products have matured to the point that midrange devices are nearly as good as high end ones, and flagships have little left to differentiate them. It's a great time to be a tech consumer. Not so much to be a tech competitor. If iOS didn't look like it was designed for Fisher Price graduates, maybe more people would consider it. The iPhone is so old and outdated looking and phones in general have reached their saturation point.